Keep reading down the page for the Hawks official team results or click here to go directly to the results. WHEW!!!! 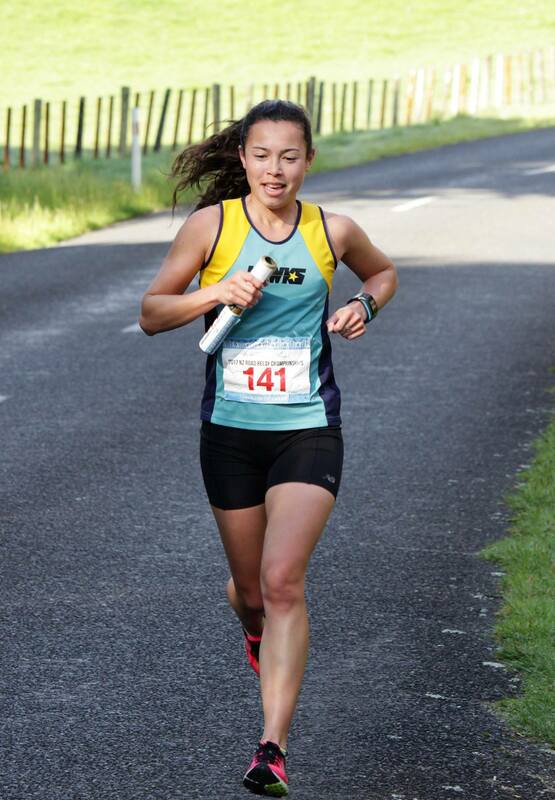 Hawks are the top club in road running and champions of New Zealand. 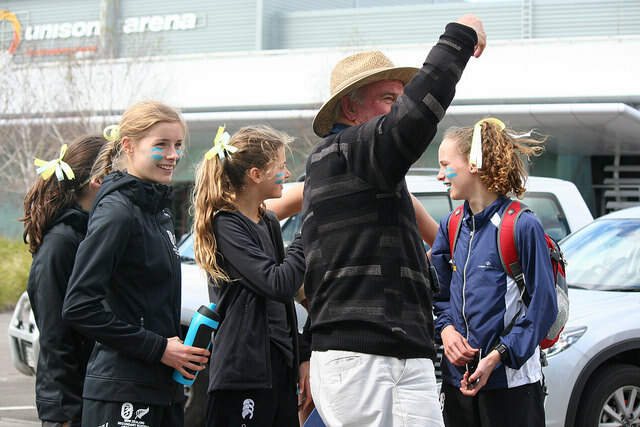 What an amazing weekend in Rotorua and a huge thanks to John Crane and Glenn Sexton for their efforts throughout the year to get nine teams to the start line. 111 teams took part and it is a reflection of what great spirit the club has that even at the last minute we had runners who were upgraded to a higher team and managed to produce outstanding runs. Maureen Leonard was a classic case taking out the fastest lap on her leg. Since 1999 when I was race director on a new course based on Cambridge the Hawks have featured in the top 3 ranking most years. That year the Masters Women won and the Junior Women were third. And now follows a brief history of the club’s record as I know it. In 2000 the event was held on the Motueka Nelson course and MW won again while the JW were first and we were second club overall. As Brett Addison points out it took 17 more years for our JW to win again. 2001 was Takahe Akaroa and the MW team kept on producing wins and one memory I have of that year was the huge skin flaps on Bridget Ray’s feet after a flying downhill leg. Our JM led by the Robertson twins won to great excitement and we were again second club. In 2002 and 2003 the event was based on Fielding and our MW, JW and JM did us proud with medals but still the top club eluded us. It was Nelson again in 2004 and no gold medals but once again MW 2nd, JM 2nd and JW 3rd produced top runs and we were 3rd in the club comp. 2005 the event returned to Takahe Akaroa with no wins but a 3rd in the top club. Then followed Feilding, Timaru and Mosgiel and while we were knocking on the top spot never clinched it. 2009 on the Banks Peninsula we finally “knocked the @#$% off” with MW in first, JW second and MM third. Finally we had done it and a very emotional Don accepted the gold medal. The next year in Inglewood we won again while Hunua 2011 with no golds but plenty of minor placings like seconds to SW, MM and MW we were second ranked club. The next four years I was not fully involved due to poor health but we were still up there. Last year in Rotorua we finished 1st equal and finally in 2017 we cracked it again. What a tribute to those who led the club so ably this year and kept the members focus on aiming for Rotorua. 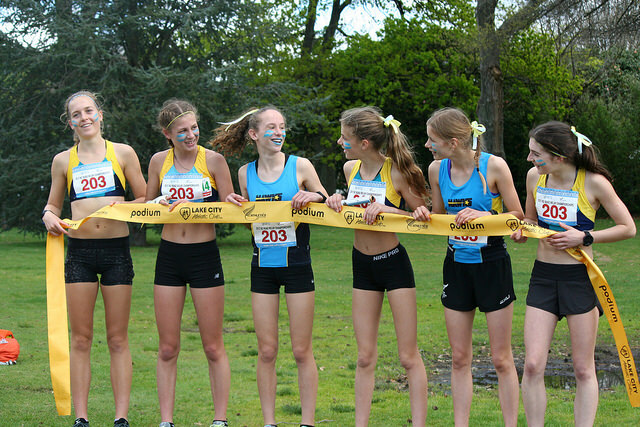 Winning a national relay is all about having every member running to their best on the day. In Rotorua we had replacements in each team that won a medal but they still produced their best. The fact that we had eight runners who scored fastest lap in their race was a measure of how the club has real quality. Nancy Jiang, Marion Millward, Maureen Leonard, Aimee Ferguson, Grace Ritchie, Samantha Corbett, Emerson Deverell and John Crane all ran the quickest times for their lap which was brilliant running. I was privileged to follow and assist Wendy Harris with the Junior Women’s team as a passionate Hawks supporter. Aimee Ferguson gave this team a brilliant start and was 3 minutes ahead after the first lap and this lead was built on successively by Grace Ritchie, Jemima Antoniazzi, Samantha Corbett and Emerson Deverell which meant Charli Miller brought the team home in first more than 7 minutes ahead of second placed Wellington. Giving time splits and encouragement throughout each was a privilege and a thrill for the old fella. I was even happier at the finish when our Masters Women came home in first spot and then our senior women took second behind North Harbour Bays. Pens and rule books came out and Glenn did some hasty calculations. Were two golds a silver and a bronze enough to be top club? I had been given the word early on that we had won but had to keep a lid on it until the prize giving. I am very proud to be a Hawk and viewed the whole day as a wonderful running experience in the club’s history. The fish and chips and red wine back in Cambridge tasted top stuff on Saturday night as Rae and I reflected on a super day. I was privileged enough to have the opportunity to drive the Junior Women again this year and was not the only one who felt like we had some unfinished business after last years race. It was clear from the beginning that although the girls didn’t want to put too much pressure on themselves they were a team that believed they could win! And win they did. Aimee Ferguson was our starter with her last words to me being “I have to remember not to start with the boys and do my own thing”. Obviously that went out the window as when we saw her 1km in she was the lead girl and was running with the boys. 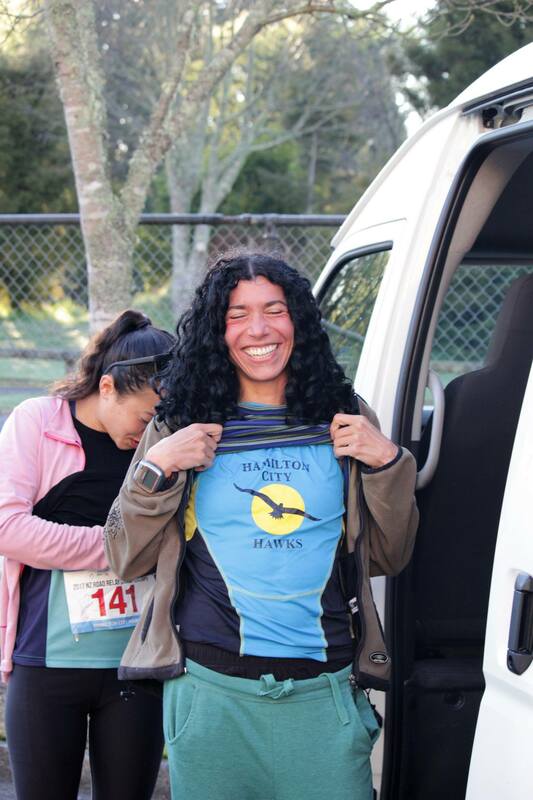 A strategy that worked anyway as she led the JW race from the start and ran 2 minutes under her estimated time to put the team into a healthy 1:20 minute lead. Grace Ritchie set off up the hill and managed to keep with one of the JM teams and run a really gutsy second leg looking determined and focused all the way. Lucky the team was well organised in getting to the changeover in time as Grace was also 2 minutes faster than her estimated time. The lead was extended to 2 minutes and Jemima Antoniazzi, our youngest runner at only 14 took off down the hill with those long legs of hers flying. At times she was going so fast around the bends that she could hardly stay close to the edge of the road. At the changeover the baton was passed to Sam Corbett and the lead had extended to 3 minutes. Sam was pumped and ready to go, focused and prepared to keep the team in front. Sam’s run was solid and consistent from the word go, she did a PB and gained another minute on Wellington the team behind. Emerson Deverell then took the baton for the team with Don Willoughby hot on her tail calling out encouragement all the way. By this point it was extremely windy with big trucks racing past making it not the most pleasant experience for Emerson. She never gave up and pushed through until the end was finally in sight. Her first words were “I’m so sorry I’ve let the team down”. I think she might have been hallucinating a little after giving it everything she had as she had gained a massive lead over Wellington extending the time difference to 7 minutes. Charli Miller was the last runner for the team with the longest lap to take the team through to the finish. 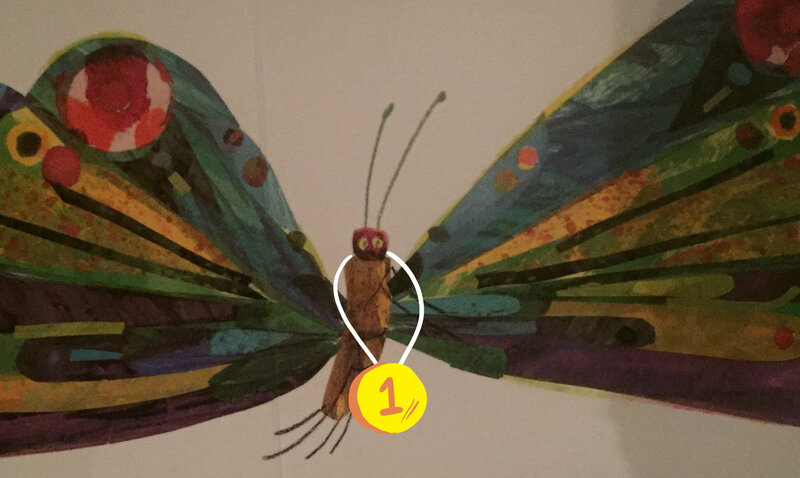 She was lucky to be in the team due to having a broken arm but complete with cast in tow she headed off with only one job to do – get to the end in front of all the other teams. Driving past Charli running strong the girls allowed themselves to believe that short of a disaster befalling Charli the win would be theirs. Hamilton City Hawks Junior Women – Gold Medal Winners – National Champions. Congratulations to all the girls for racing so well, giving it their absolute all, showing great sportsmanship and for generally being awesome. A special mention to Lillie Harris for her great photography, time keeping and navigation skills. Also a big thank you to the support crew out there on the course, Dean, Megan, Grant, Kevin and the man with the famous milkshakes Don Willoughby. With managing to be able to get two senior men’s teams fulled with senior men without having to steal masters or female runners there was some excitement around what might unfold for the Senior Men 1 team who were in the A grade. With Malcolm King leading us of on the 1st leg he was really wanting to keep us in contact with teams ahead of us going pass him at around 3.5 km mark he looked relaxed but with the hill to come what was going to unfold. Well from all accounts he gave it his all up then down the other side to come in very wobbly and with us screaming for him to sprint in, it was very apparent he had gassed himself and was spent. Making it to the change to hand over to Jai Davies Campbell who shot off like a bullet to run down the guys ahead. Leaving us to deal with a very stuffed Malcolm who we had to leave at the back of his car and we were of to see what Jai was doing he was going just fine gaining in on the Wellington Scottish runner and just as Jai was about over take him he stopped to do his lace up. Jai smashed his leg gaining some good time on two teams in front to hand over to myself and give me something to chase down and extend on behind. With each km ticking over I could see I was clawing back time on the 2 runners ahead of me. I know going up the hill to the change I was going to pick at least 1 off and get really close to another. Theunis was there waiting and went out quickly having some good competion just a head and Matt Scott chasing behind. To some of us in the van we were starting to think we may of put him on the wrong leg but no he worked really hard to keep a gap on Matt behind but also got us really close to Tauranga Ramblers which got some excitement going as now there was a race on for top Waibop team. Giving the batton over to Russ at the top of the hill a bit of excitement ensued as what was Russ going to do to this leg specially the down hill section by the time we caught up to him he was already past Tauranga and making some great headway although Alice and B(dog) who were our chief supporters started to worry that he was hurting himself and Alice had to grab a beer to calm her down. Russ got to the bottom of the hill and set of to bring home a good run with some little white lies by us in the van saying it all down hill from here and flat we forgot about the last hill (sorry Russ) which he smashed and brought it in for Rodrigo to head out. Rodrigo set out like he was going to kill his leg and extended the gap on the teams behind for the first time in the day if was now more of Rodrigo doing a time trial and holding our place and seeing if he could take time outa Christchurch Avon to give Jacob a chance. Rodrigo got over the top of the hill and set about trying to pick up the pace down to hand over to Jacob who was just like Rodrigo of consulidating our place in the race. Looking really smooth he ran a great leg to bring us home in 7 placing. The first runner in our team was Kovo. She run in fourth place for some time right behind the 3rd girl, but then, as she put it, “got tired of the view” so took off and got us to 3rd place with a good lead. 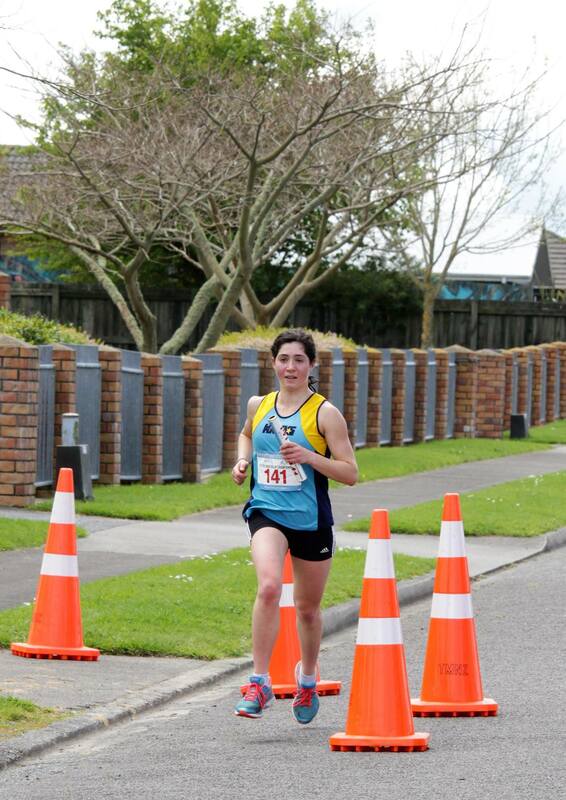 Our second runner was Malesa which, for the first time in 3 years, was not sick on the day of NRR, and it showed!! She got a PR 5km and, with a 56 seconds improvement over last year’s time, closed the gap with the second girl by over a minute. Next up was Dawn, she had a good solid run and kept us in third place with a good lead. The first section of leg 3 can’t be followed by van so we didn’t see Dawn for a little while. During this time me and Malesa had a cool down/warm up jog and were surprised at how badly the course was marked until we got to a motorway and realised that we were not on the course at all! Malesa’s excuse was that she had just run her guts out, my excuse…well lets not dwell on that. I was up next after Dawn. Given that the distance, how did Mike Harris put it, “had a zero less than what I am used to”, I think I did ok. I took 39 seconds off last years time and LITERALLY ran my guts out.. I have to admit that if the course had been a tad bit longer it would not have been a pleasant ride in the van for any of us. Given my state the baton change between me and Nancy was hilarious. I had eyed the portaloos even before the change over and all I wanted to do was get to them as fast as possible, so much so that I went a little too fast and almost ran over Nancy after handing her the baton. Luckily I veered in time and headed for the cones instead…. Nancy’s run was amazing as usual. She took two minutes off the second girl and got us to 2nd place! We heard a lot of ”who the hell is this girl” from the other team..
Then came the turn of Veronica. She struggled a bit at the start due to stitches but then, thanks to Graham’s great suggestion of “open your legs”, she kept 2nd place with a good lead. The final leg was run by our runner of the day Olivia. She ran an amazing final leg and opened the gap from the third place by a few minutes. She said she ran scared the whole time thinking the other runner was right behind her. We didn’t tell her that in fact she was miles away…good strategy team! After all these adventures we managed to take home Silver! An early rise for the old men .. first race start at 8:00am. We’d done our research … realistically we knew that the two Wellington clubs were a lot stronger and were likely to take the first two places … so it was looking like we’d be in a three way battle for bronze with Auckland City Athletic and our old mates Papanui Toc H. But then again … anything can happen on the day! After so many years of running the National Road Relays this was the first time I’d ever done the first leg. I’d been worried about a back injury, but thankfully all went well and we were on our way, with a narrow lead over Wellington Scottish at the first changeover. Chris Keith up next. The big guns from Wellington were starting to fire, but Chris ran a great leg and kept them very much in our sights. Third leg was Oscar, keeping us in the the battle for bronze with a gutsy run and uphill finish. By leg four the two Wellington teams were having their own battle up front. Auckland had got ahead of us and Papanui were putting us under pressure. Kevin put in a fantastic effort and kept us very much in touch with Auckland in the chase for bronze. 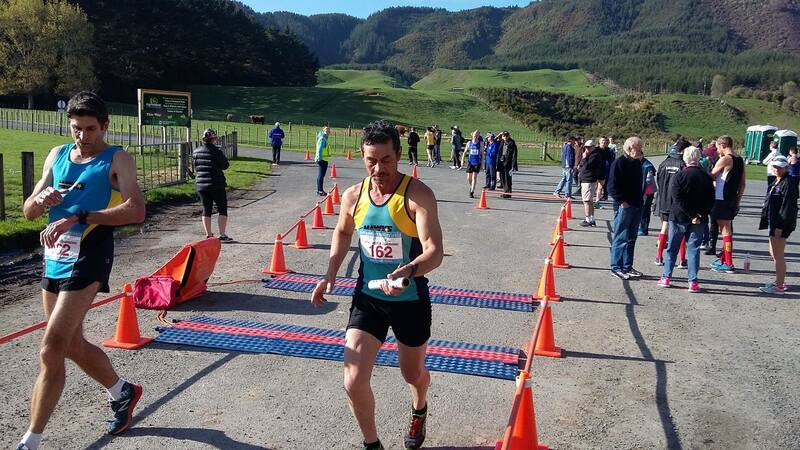 Then it was Chris Smith … just a week after running the Rarotonga 32km race. Somehow he’d managed to recover from that and put in a huge performance. In fourth place still, opening the gap on Papanui and still just over two minutes away from Auckland. Leg six was Garry. 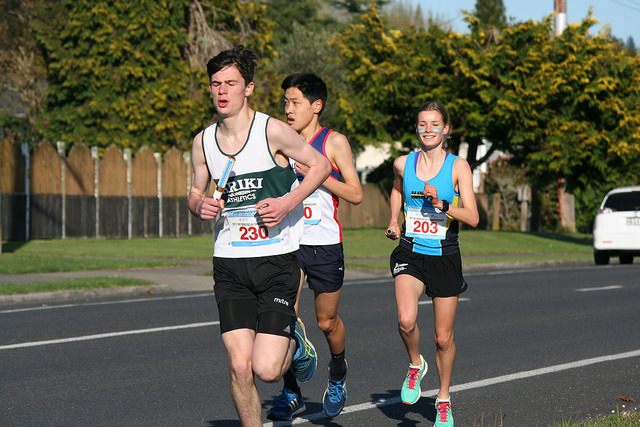 After many years of running relays with Garry we know what to expect … he puts everything into it, and this year was no exception, running hard out at the start to cut the gap to the Auckland team and holding on grimly to the end of his leg. Never a pretty sight! Last leg … great to see Tony Olsen back running the NRR after a few years out. 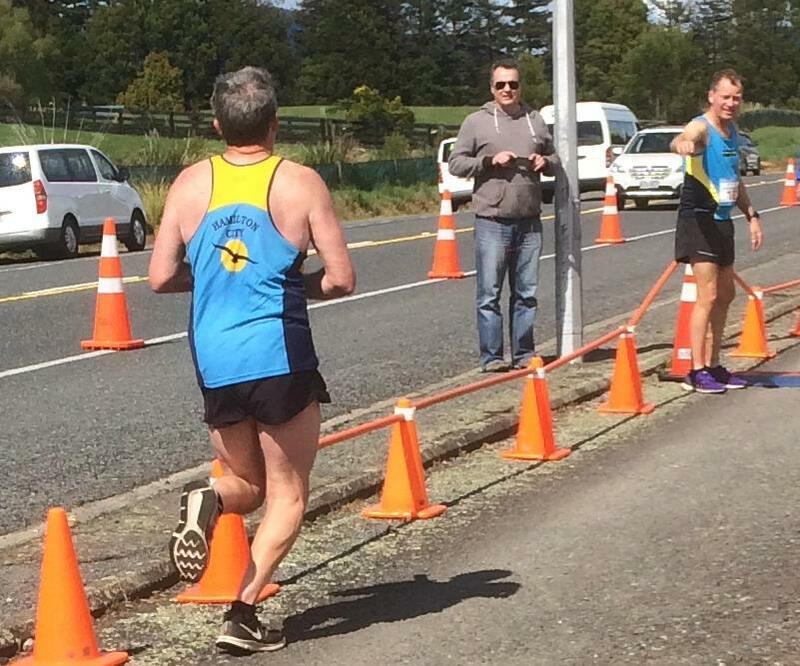 He had over two minutes to make up on top Auckland runner Alastair Prangnell, and had to keep an eye on Papanui who were over two minutes behind, but had Richard Bennett on their last leg (and I know how that feels from about 15 years ago!). Then a bit of drama in the battle up front between Wellington Harriers and Wellington Scottish. 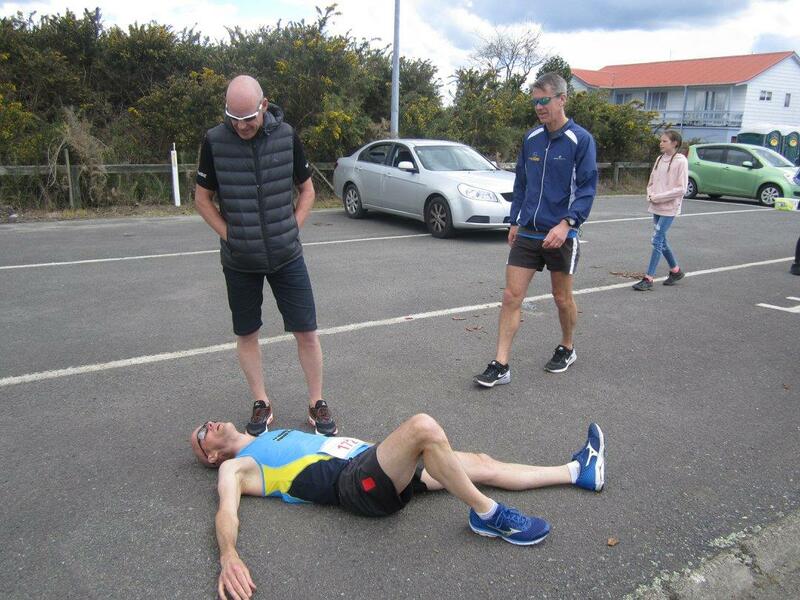 The Scottish leg six runner had come to grief, collapsing about 500m short of the handover, resulting in a seven minute penalty and throwing things up in the air for the minor medals. Tony went after Auckland and ate into their lead from the start … it was going to be close. In the meantime we were trying to work out if Wellington Scottish were likely to finish more than seven minutes ahead of us. We gave Tony one last boost of support then into the vans to the finish, fighting the traffic and lights we arrived just in time to see Auckland holding on to third place over the line, with an exceptional run from Tony to put us just over a minute behind in fourth. We still couldn’t work out whether we’d finish ahead of Wellington Scottish once their penalty had been applied … but then the results were announced, confirming us in 3rd place. 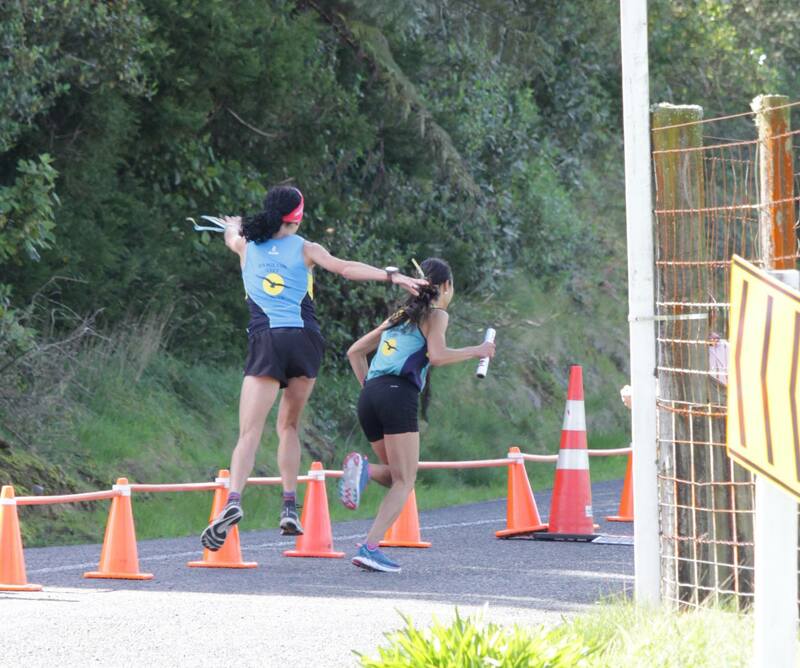 It never feels quite right to benefit from another team’s misfortune … but that’s all part of the drama of relay running, and it was good to hear later on that the Wellington runner was OK after a short spell in Rotorua hospital. A great result for the old fellas, and at least we managed one medal for the men . We also realised that all those years of close battles in the MM40 grade that started 10 years ago against Wellington Scottish and Papanui are starting to come round again … same old battlers, just 10 years older! Bring on 2018 in Akaroa! In the light of the moon a little MW relay team lay on their beds wondering what the next day would bring. In the morning the sun came up and ‘pop!’, out came the team, hungry for victory. On leg one Kirsten ran her best, she ate through one runner. But they were still hungry…. On leg two Helen ran fast and well, eating through TWO runners. On leg six Maureen ran reliably well, eating through one Olympic, one composite, one Lake City, one New Brighton MM, one more composite, one Wellington Scottish and (most importantly and truthfully)…..one Wellington Harrier! That leg we all had a (nervous) stomach ache! The next runner was Bridget Ray and she did a stunning run in a high pressure situation. And after that the team felt much better. Now they weren’t hungry anymore, as they suspected that something great was about to happen. However they had to stay in a cocoon for more than two hours until results were officially announced. 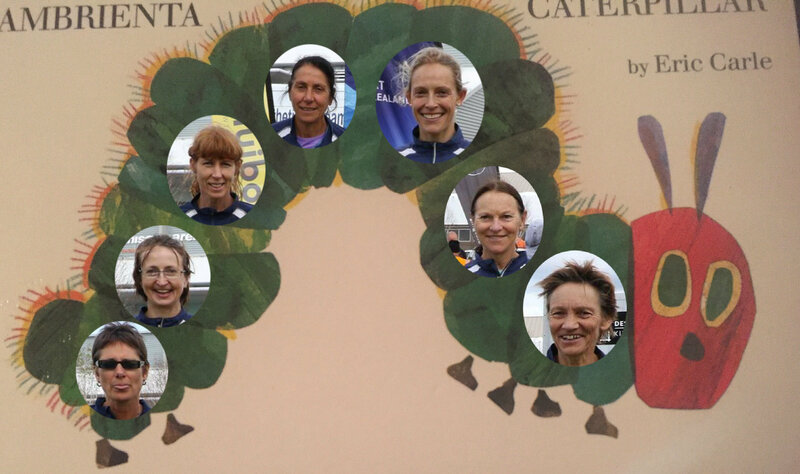 At prizegiving they went up on stage and…….. They had a beautiful gold medal!! After medalling the last four years our 7th this year didn’t feel too good, but shows where we’re at with a lot of us late 40’s now. A big thanks to Nick as our hot spare and Hadley coming into the team a fortnight before race day. We were a massive 15 minutes off 1st, 11 minutes of 3rd The top three teams were well ahead of the next five teams that we were competitive with, 4th team finished 3:51 ahead. Saying that we had a great day and refocused on beating Lake City (fail) and the leading Senior Womans team, North Harbour Bay (win). Our team, in order of legs – Glenn Sexton, Kent Hodgson, Hadley Craig, Marc Scott, John Bowe, Mike Harris and Mike Causer. Glenn got us off to a good start in contact in 6th and ahead of Bays. We stayed in the 5th to 8th place throughout the relay. 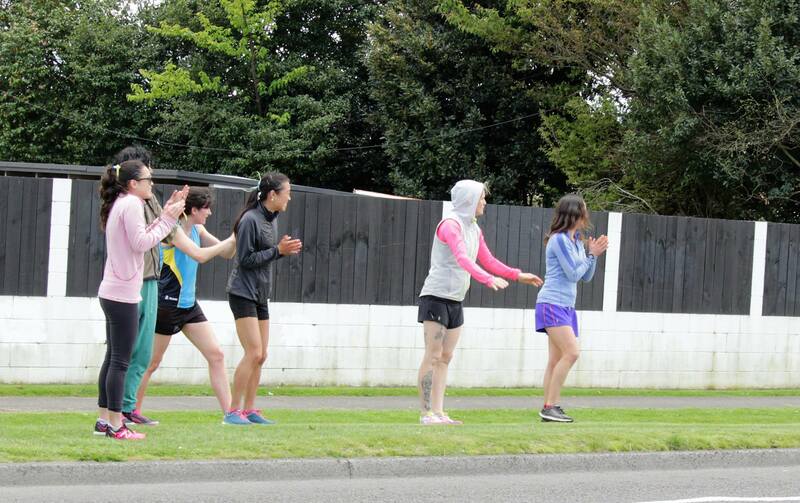 A couple of our blokes got “chicked” by our Senior Ladies runners, I could have been one of those. Thanks Cecilia. So what really mattered… a leg to go, a minute down on Bays. Mike Causer says “no problem”, “walk in the park”. Mike comfortably reels in the Bays runner and we smashed them by 5 seconds! Nice. Recruitment started on Tuesday with Jason signed up. Need a few more to stop John Bowe and Mike Causer heading off to Tibet for a self-imposed 5 year exile and zen life!